Imperishable Night is the eighth game in the Touhou Project series. (Touhou translates to Eastern literally.) The Touhou Project is a one-man project by a Japanese amateur game maker, ZUN, who did all the graphics, music, and programming alone. The Project started getting attention after the release of its sixth game, Embodiment of Scarlet Devil, in 2002. Since most of you probably haven't heard of this game before, I'll first give a very brief introduction to this game. 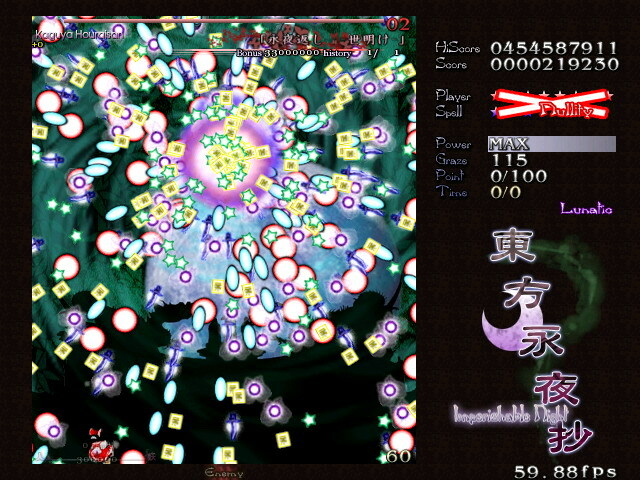 Imperishable Night, just like most of the recent Touhou games, is a vertical scrolling shooter (shoot'em up) with major focus on bullet dodging. This genre of shooters had become quite popular (especially in Japan) that people started using the term bullet hell (a.k.a. curtain fire, maniac shooters, etc.) to describe them. Imperishable Night has 6 stages with 4 difficulty levels (easy, normal, hard and lunatic), plus a hidden Extra stage. Like every shooter your objective is to make your way to the Final Boss (and "kill" her, of course) by shooting down (or evade) every enemy aircraft in your way. As I mentioned above, this game belongs to the sub-genre called "bullet hell" which features LARGE numbers of bullets with aesthetically pleasing patterns. You can see around 300 tiny bullets constantly moving on the screen. Unlike most traditional shooters back in the 90's, the collision zone of your aircraft in this game has a reduced size of about 5 pixels by 5 pixels. Also, you can slow down your aircraft by holding the Shift button (sometimes this switches the weapon mode as well, though). The above two features allow you to effectively fly through tiny gaps between bullets with pixel accuracy -- in fact, pixel accuracy is often required to evade some of the bullet patterns. There are 8 characters you can choose to play as. Some of them can be paired up (you can switch between two characters by holding Shift in game), creating another 4 new "characters". Each character has a pretty unique style of weapon and motion. There is a "bullet pattern challenge mode" ("Spell Practice" in the game) in which you instantly meet a boss and shoot against one of her bullet patterns. This is a valuable game mode for those who don't want to spend their time going all the way up shooting little sprites, and getting killed just before the boss appears. There are dozens of cool original background music and sound effects. Some of them have been rearranged and released as CD albums. Bullet patterns are cool, even if you cannot dodge them. Some of them are quite "mathematical", such as spirals and sine waves. Some of the bullet patterns are just too difficult to dodge, even for experts in traditional shooters. For one of the most challenging bullet patterns I spent several hours trying 300+ times to beat it; and another 200+ attempts before I beat it for the second time. Frustrating. The graphics isn't really awesome but the frame rate goes down to 30fps on occasions. I cannot tell for sure why this happens... perhaps refreshing a screen with 1000+ moving bullets is too much for an ordinary graphics card? Everything's in Japanese. I didn't quite get the story.